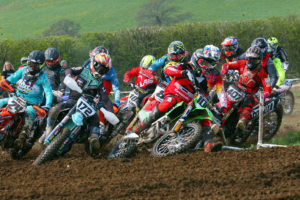 Over 170 riders attended RAW Enduro’s latest weekend of enduro action at Tong last weekend. A Double Points championship round saw all RAW regulars flocking to Tong to try grab a haul of points on the day. Not surprisingly riders praised Clerk of the Course Wayne Braybrook for making Tong “Different” to the norm, Braybrook has 10 years experience of marking out quality Enduro courses, that coupled with 35 years as a rider means he knows his stuff. A small Youth Entry saw Isle of Man resident William Cawte take the Youth B class win in fine style. Sam Boyd battled hard to place runner up despite being kept honest by Hayden Stansfield in third. Smile of the day goes to Archie Roberts for finishing this “real Enduro” event. Those who helped this lad please take a bow, no more to be said apart from the show of proper friendship during race weekends in the Youth Ranks. Jamie Williams fresh from his “holiday” in Turkey narrowly held off Bert Crayston in the Youth A class to take the win and championship lead. RAW Team rider Richie Moorhouse did a great job taking third place having only just had his plaster cast removed from his wrist days earlier. second place. Danny Philips was delighted to take third place after just piping Lewis Moore at the flag. World-renowned spanner man Factory Kev Hipwell was at the top of the Over 50 class, he held a 4-minute advantage over second placed Andrew Dean. Andrew actually cut his Family Holiday short to land back in the UK on Saturday ready for RAW Sunday. Committed to the job or what! After a short break for the morning event presentation and results, the RAW marshals tweaked the course to add a little hard enduro section on the Rock slabs for the afternoon race. Lee Sampson out on a 125cc Sherco was right at home from lap one. Buzzing along on the small capacity bike Sampson took a one-lap advantage at the flag. Trials ace now enduro fan Henry Moorhouse was runner up, with RAW Regular and now Expert championship leader Phil Hancock taking a well earned third place. Lewis Ellis set the books straight on Sunday by winning not only the Clubman Race but he also sealed the Championship for 2017. In only his first full Enduro season Ellis now heads to the expert class as Clubman Champion for 2017. Local lad James Hirst took second place less than 3 seconds ahead of Stephen Hind at the flag. In the Expert Vets class John Bradford was kept honest by Neil Croston at Tong, JB had to work hard to take the class win. Mark Raynor finished a close third place in class. Finally the Clubman Vets class win went to Lee Pallet with James Cooke Thomas continuing to Improve despite a trip into the pond on the final lap of the race, which cost him at least one minute. Andy Williams was the final Clubman vet trophy winner. Once again RAW Enduro added a challenge to the Rock Oil Championship. Tong thank you for having us, you provided the platform for us to create another great RAW Enduro Event. A Fast turn around to the final round of the championship, a fully graded Driffield waiting for October 21/22nd weekend to finalise the standings at what promises to be a real race to the flag for 2017. Thank you to all spectators, competitors, and marshals, for making this event an enjoyable one. Keep up to speed with RAW Enduro on socials and via the RAW Website. Track updates from Thursday. Online entries, 2018 Early Bird Membership applications, and Enduro Training are all on the easy to navigate RAW Enduro website.